Students determined a topic of interest, violence in video games. We explored the topic, graphing our classes video game data, reading non-fiction texts about the good and bad effects of video games, and finally speaking to an expert from the gaming industry. The unit was driven by student choice and student created questions. Students also decided on a final action step and learned to critically analyze the video games they play. 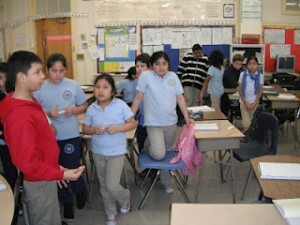 During the Winter of 2011-2012, the 4th grade students of Room 113 at Abington Avenue School participated in a community walk in which they visited their favorite community restaurants and stores. This began their journey to investigate their community. This blog is dedicated to chronicle the activities and experiences of the students as they attempt to make their neighborhood a better place to live. Ultimately, they decided that the most prevalent challenge to their direct community was violence, specifically bullying. After weeks of investigating and learning, the students produced signs and commercials meant to help raise awareness and motivate others to stop bullying. We hope to also be a part of creating a school wide conflict resolution group. Visit the link to view more details and process of our project. focus on social justice issues such as racism, gentrification, fairness, child labor etc.